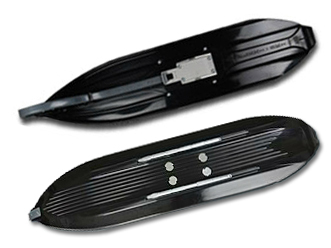 The Flexi-Ski has always offered unparalleled control, floatation and stability. Now the Gen III offers even more control. Simmons took all the knowledge & experience of the original and Gen II flexi-skis, and created the next generation, the Gen III ski. It's the best of both worlds. At 8 inches wide, the Gen III offers sports car handling. 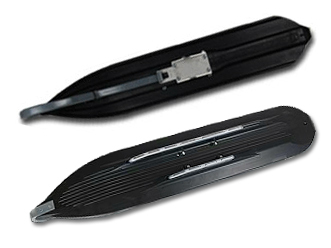 Simmons modified the dual keel/concave design by placing the keels closer together. 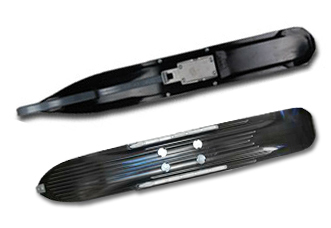 The outer keel is shorter than the inner keel, which increases overall ski performance. Turning is sharper than ever. Simmons has also introduced a new skag design. Combined with the new ski design Simmons was able to place the cutting carbide under the spindle to aid in turning. Another Great Solution by SureTrac Systems! The Cover Saver is an original accessory to the R.V. marketplace. 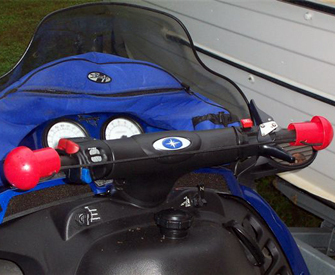 This product will fit any vehicle's handlebars, no matter what season or type of vehicle. For example: not only snowmobiles, but also personal watercraft, motorcycles, ATV's, and mopeds, etc. Our COVER SAVER consists of two pieces of high-density polyethylene plastic, that fits over existing handgrips before installing the cover. They allow the cover to slip on and off much easier and increase the life of the cover, especially while trailering. Cover Saver is specifically designed to help save your cover. Cover Saver is Available in Two Colors: Red & Black. Click Here for Pricing and to Purchase Cover Savers. Do you have a drive-thru trailer or a specialized application? Sure Clamp Quick Release is Your Solution! Sure Clamp quickly secures your ATV, snowmobile, or other machine to your trailer. Easy release for quick loading and unloading. Our Quick Release Models are designed for Drive-thru trailers or Specialized applications. 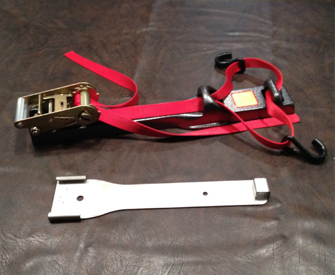 It easily installs onto most trailers utilizing the existing mounting stock clamp holes. 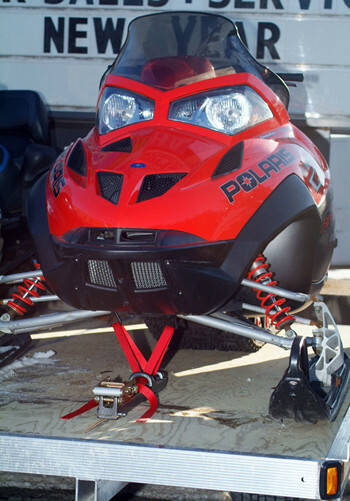 Once in place you can tie down your Snowmobile/ATV’s in seconds. This system utilizes an extra heavy-duty ratchet and strap with rubber coated hooks, that are placed over the Front Suspension, thus causing no harm to your machine. When used properly, Sure Clamp does not loosen up, unlike conventional Ski Clamps. All it takes is a flip of a lever and Sure Clamp releases.